Regardless of your age or skill level, We’ll work with you every step of the way to learn Lightroom and photography with patience, complete dedication to your learning experience and a healthy sense of humor. 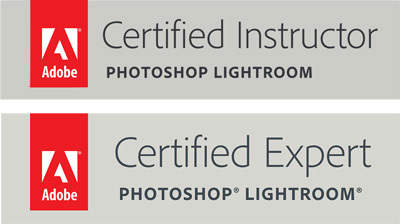 Our Adobe Certifications mean we’ve demonstrated exceptional teaching skills and passed Adobe’s stringent certification test that guarantees high standards as Lightroom experts. Whether personal or professional, at your location or online, we’re working photography professionals who can meet every need at any level. D.A.Wagner is a long-time professional studio photographer in New York City. He is thoroughly experienced with flash and available light, and knowledgeable with all types of digital cameras including DSLRs and Medium Format. He has hundreds of awards for his advertising and editorial photography and has work in the permanent collection of the Museum of Modern Art. David Mark Erickson has over a decade of national and international experience as a photojournalist and commercial photographer covering politics, life and culture throughout Eastern and Western Europe, the Balkans, the Middle East, Greece, Israel and Australia. Prior to becoming a professional photographer, David lived in East Africa working as a wildlife conservationist for nearly a decade. As experts in this go-to photo processing software for digital photographers, we will get you up and running, developing your own photos and managing your photo library in short order. If you already have an existing library with Apple’s Aperture, iPhoto or Photos, we can import it to Lightroom for you so all your photos are in one place. We also have special expertise providing one on one photography lessons for busy corporate executives and retirees who may be returning after a long hiatus to their love of photography. And even if you’re picking up a digital camera for the first time, you’ll find your private photography and Lightroom lessons fun and easy. We are both top rated NYC tutors. Here are some of our reviews. You can’t help but become a better photographer by learning Lightroom. No matter what level photographer you are. Students just get better. We’ve seen it happen over and over during our thousands of hours of private coaching.